Today the editors of USA TODAY added a Special Section to their national newspaper called Sharing in the USA. This is an annual attempt to focus on charitable giving. Included in this section is a list of national charities that have earned the Seal of the Better Business Bureau as an Accredited Charity. Of all the nonprofit organizations in the USA, only about 300 have met this set of rigorous and comprehensive standards that are independently researched and verified by the Better Business Bureau in Washington DC. The 20 standards cover Governance, Fund Raising Practices, Finances and Financial Reporting, Donor Privacy and Transparency of national charities. CFHI is proud to be a Seal Holder of the BBB and to have, once again, made this list. It is a testament to the hard work of our Board of Directors and our Staff who are dedicated to the highest standards of nonprofit management striving to run socially responsible programs with accountability and transparency. 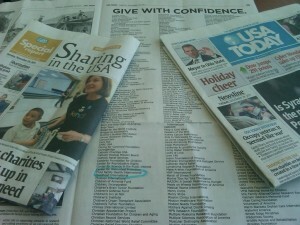 All the national Seal Holders are listed on the full page ad under the banner headline: Give With Confidence. The BBB calls this the Wise Giving Alliance Accreditation Standards and issues a report on national charities which is visible on their website. This is an effort to offer a resource to help those who want to research their charitable giving and have some independent verification of the claims that a charity might make. You can see the report for CFHI as prepared by the BBB earlier this year. This entry was posted in Ethics and tagged BBB, cfhi, Global Health Elective, social entrepreneurship, Socially Responsible on November 29, 2011 by Jessica Evert, MD.